Shed Long seemed to be closing in on the Majors. Now he has a new destination in mind. Cincinnati's No. 7 prospect is headed to the Mariners in a three-way trade that sends Major League right-hander Sonny Gray and Minor League left-hander Reiver Sanmartin to the Reds and No. 10 Seattle prospect Josh Stowers to the Yankees, the clubs announced Monday. The Yankees will also get a competitive balance round Draft pick in the trade -- a selection currently sitting at No. 36 overall. Long spent the entire 2018 season at Double-A Pensacola, where he hit .261/.353/.412 with 12 homers, five triples, 22 doubles and 19 stolen bases over 126 games. His 120 wRC+ ranked 11th among the 43 qualified hitters in the Southern League. The 23-year-old second baseman finished out the year in the Arizona Fall League and was named an AFL Rising Star. He produced a .241/.333/.310 line in 19 games with Scottsdale. The 5-foot-8, left-handed hitter has climbed the ranks from his status as a 12th-round pick in 2013, showing an above-average hit tool and decent power. Originally used at catcher, he moved to second base in 2016 and is still considered a defensive project there. However, the bat is good enough that Long could find a way to the Majors soon, and it should help that he's headed to a Seattle club beginning a rebuild. Long was added to Cincinnati's 40-man roster in November 2017 and will need to be placed on Seattle's following the swap. Stowers is on the move less than a year after the Mariners took him in the second round (54th overall) out of Louisville in the 2018 Draft. The 21-year-old, right-handed-hitting outfielder batted .336/.477/.559 with nine homers and 36 stolen bases in his junior year with the Cardinals and carried that production to Class A Short Season Everett, where he had a .260/.380/.410 line with five homers and 20 steals in 58 games during his first taste of the pros. Stowers' best tool is his above-average speed, and his plate discipline should help his overall offensive profile. But his arm is considered below average, and it's still a question whether he'll stick in center field as a result. If he does move to a corner, there will be added stress on getting the bat to perform. 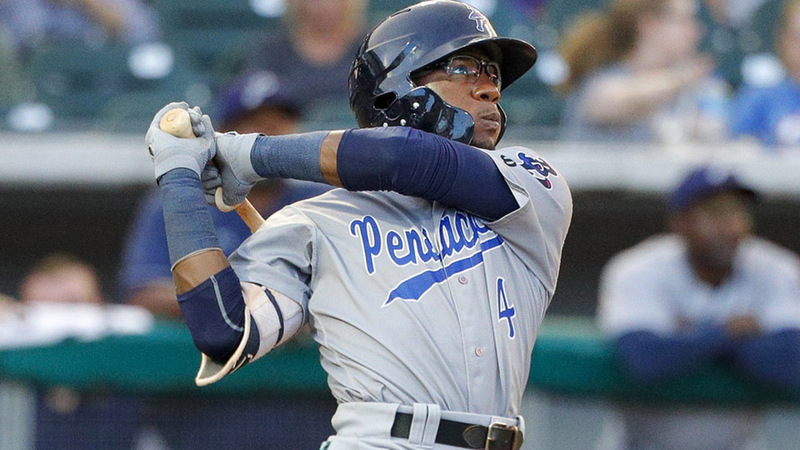 Sanmartin is involved in his second trade in the last 14 months after being moved from the Rangers to the Yankees for Ronald Herrera in November 2017. The 22-year-old left-hander's specialty is control, walking only four batters in 67 1/3 innings across three levels last season. He finished with a 2.81 ERA, 1.02 WHIP and 58 strikeouts over that span as well. Not ranked among MLB.com's top 30 Yankees prospects, he could be headed to a relief role at the upper levels, though his strike-throwing ability could keep him as a starter a bit longer. Gray is the centerpiece from a Major League perspective after the Yankees made clear this offseason they would look to move him. An All-Star during his days with the A's, the 29-year-old right-hander struggled after moving to the Bronx in July 2017. He finished with a 4.90 ERA and 1.50 WHIP over 130 1/3 innings with the Yankees last season and was moved to the bullpen in August. However, much of his struggles came at home at Yankee Stadium, where he had a 6.98 ERA over 59 1/3 frames in 2018 compared to a 3.17 mark in 71 innings on the road. He'll also be reunited with Cincinnati pitching coach Derek Johnson, who worked with Gray during his days at Vanderbilt.